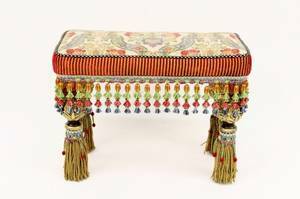 Mackenzie Childs whimsical upholstered bench of rectangular form with brightly colored tapestry fabric covered seat with black and cream checkered trim above burgundy velvet striped fabric above dangling green red, gold and blue tassels. Bench raised on four legs with large gilt accented acorn or pineapple forms and additional tassels and trim. Underneath with company metal label. Height 18", width 25", depth 13".